Yup! No need to go the little boys section of Brooks Brothers! Because the retail folks at Gap and UNIQLO listened and came out with shrunken blazers that will look so great with everything! I must say, Gap's "Blue Redefined" campaign made me a believer once more! They had so many things that I want in my closet! The shrunken blazers of course, plus boyfriend cardigans in navy and grey, a couple shirt dresses, and a thin bright yellow belt that will put some needed color in my closet! It was great to re-discover UNIQLO. I first discovered it in Shanghai back in 2004. I knew there was a flagship store in New York City but didn't see it until DH and I were walking around downtown and stumbled upon it. So I'm pleased to know there's one in SOHO, on Broadway, when I feel like stocking up on affordable basics! Their cashmere sweaters and shawls are currently on sale, only $59.99, sooo tempting! For those not familiar with UNIQLO, it's a Japanese label known for quality and value. Founded in 1984 in Hiroshima, Japan (the same place bombed by American planes in World War II), it has grown to over 760 stores worldwide and is household name in Japan. Think of it as the Japanese version of The Gap! ooooooooooooooh! 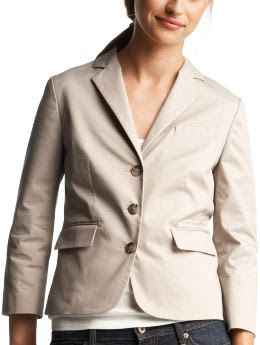 i love those shrunken blazers! I think Chelsea Clinton was wearing something similar when 'campaigning' for her mom and I thought to myself, "darn! loved that blazer!!" hopefully, GAP here will have that one too! i saw that thin yellow belt from gap too ;) i want it also including the yellow back tab mac jacket. usually i only go shopping in gap for eulla but their designs in clothes now, im liking! I am also liking the "blue redefined". I am trying to stop myself from staring at the GAP window. I saw the thin yellow belt with the denim skirt *sigh* love it. and yay for the shrunken blazer. 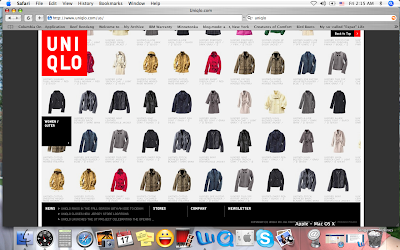 I wish we have uniqlo here in L.A.
i love uniqlo :D it's a great source for affordable staples.